Learn about many critical aspects of aging and how to better care for a loved one or patient. Created to help support family as well as professional caregivers, this comprehensive kit covers all aspects of aging and elder care, from understanding the physical factors of aging and identifying common elder health issues, to knowing when to help, taking care of yourself, and dealing with the psychological and physical issues associated with elder care. 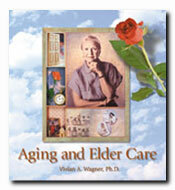 Includes a first-aid section and tips on making the home safe and livable for elders. Medical Treatment-When Is It Enough?